For a long time, Android aficionados have complained that the OS lacked any native screenshot editing tools. Their pleas have been on a steady rise since third-party phone makers started integrating such solutions, but Google’s Pixel and Nexus devices with their brand of ‘stock Android’ didn’t have anything to offer. However, it seems Google may have finally heard the community and has added a native screenshot editing tool, called Markup, in Android P‘s developer preview. This new tool enables you to simply tap an edit button from the screenshot notification and scribble over it using either a pen or marker. You also get a selection of colors (seven to be exact), undo and redo buttons, and the ability to crop images. This screenshot editing tool is decent, not too feature-rich, and gets the job done. There’s still a lot of scope for improvement, but you can still get ‘Markup’ on your device if you are looking for a basic screenshot editing tool. Recognized XDA developer Quinny899 has managed to port the Markup tool and has made it available for download on XDA Forums. You just need to install it, like you’d do with any other app, and use it to edit any image available on your smartphone. Note: The developer has highlighted that the Markup editing tool will just work on ARM64 chipsets, which you can check it by downloading the CPU-Z app. I tried this feature on my Xiaomi Redmi Note 3 and it worked perfectly fine. 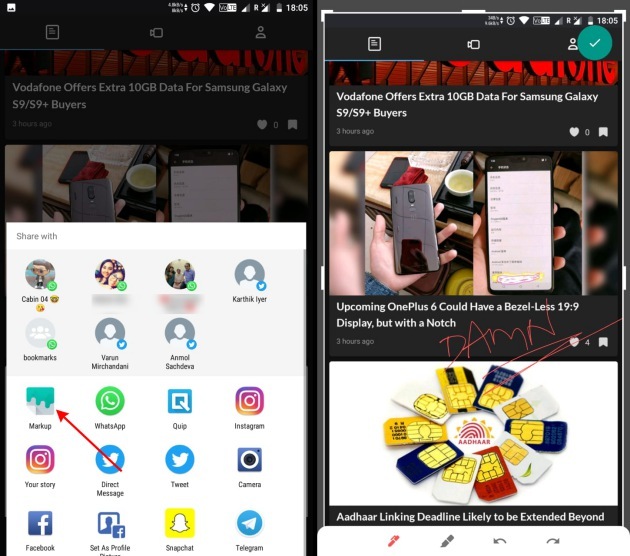 When you’ve captured a screenshot on your Android device, you simply need to tap the ‘Share’ button and choose the Markup app which will appears in the share menu. Select the same and you’ll be greeted with an interface similar to what you’ve seen on Android P. That’s it. This is a great first attempt at providing users with a native screenshot editing tool and we would like to see Google add more features to the Markup app. Download the ‘Markup’ editing tool APK right here.